2. shoot with the yashica. 4. cultivate a collection of found paper. 5. purchase a pair of rain boots. 8. write one sentence everyday for a year. 9. take on the bins. 12. take class at dance new amsterdam. 15. take ava and ezra on a photo walk. 16. celebrate with nancy and kristy. 19. make key tag jewelry with ava. 20. spend the night in the backyard. 21. fill a book with collages. 22. map out a photobooth crawl. 23. ride my bike along the eastbank esplanade. 25. finish the strangers project. 29. have a bowl of pho on 82nd avenue. 31. beat ward at pacman. 32. spend an afternoon at skidmore fountain. 33. teach ezra the rerun. 34. take back the basement. 35. fill a jar with magical thinking. 38. bake a pie from scratch. just when i'm feeling all funky, you get me inspired by all those possibilities out there in this big wide world of ours......thank you. and oh, how i hope you film ezra doing the rerun dance!! I have walked over the St. John's Bridge and it is DELIGHTFUL as is the park beneath. and there's a fabulous little cafe down the street. and my sister lives right around the corner, tell her hello and i miss her. Vancouver is great (and close to you!). We went when our oldest was just 10 months old. However, I really want to visit the east coast of Canada. Outside the cities. I think the light could be amazing. I want to learn to bake a pie from scratch too. oh i am with dani, the rerun dance! oh yes the rerun dance! thanks for sharing all your whimsy and great ideas and hopes for your new 38th year. i also love the magical thinking jar, how very fabulous is that for moms. Visit Canada! Drive from Vancouver 10 hours east and visit Calgary for the Stampede. We promise to show you a good time. And I know how you love a fair. that list is wonderful. and full of so much goodness. i hope you can do most or all of it. yep. i am still plugging away on mine. thanks for the reminder! i'll teach you to embroider, if you help me do ttv! this is a very inspiring list and since i turn 30 in two weeks i think i ought to start working on my own list. Yippee! I love to read your lists and "watch" you check off items. Fantastic list!! You may be the list maker of ALL list makers!! Can't wait to hear about #33, #6, #9, #18...Ok, I can't wait to hear about all of them! Happy marking off the list! also, that waffle cart is awesome and brilliant and tasty. jack had his first waffle there and loved it. Is this a new list because you just turned 38? Are birthday wishes in order? a wonderful list - again. i think number 8 is my favourite. and number 11 made me smile, because it's so surprisingly pragmatic, yet totally necessary. You will love Canada. Chinatown in Vancouver is unbelieveably, eye-poppingly swimming in color and form. Right up your alley. what a fun year it will be! you are a girl after my own heart. and I'm so intrigued by the 'one sentence a week'. you are indeed the list maker extraordinaire. great list. i will be turning 39 this year as well and should make a list of my own. I can help you with #38! Not nearly as daunting as it seems. Love you list, and love you, too. I LoVed Rerun and his suspender slapping dance. I love your lists - they inspire me to think bigger! I am all over #22. that sounds like the best idea yet!! I would love for you to visit Victoria, Canada. I just moved here myself from New Brunswick a few months ago, so I read the posts on your cross country trip several times before we made our trek. You would love it here, it is very bright, colorful and friendly. You would love it here - I just know you would! Those are some great ideas. Wreck this journal from Powells looks like a lot of fun, and I've walked the esplanade a few times-- when the weather is nice it's so pretty! hi thank you for reminding me about the magical thinking jar 35. I saw it a while back because of Lilly and I almost forgot. My 2 yr old twins are just learning to talk and said the funniest things ...well the bits I can understand. I found you because of Kate. perfect andrea! it's going to be a good year! Also - left an award for you at my blog. You'll definitely need to do #5 before you do #3! Thanks for reminding me that the most wonderful things in life are right in front of us, waiting for us to notice them...and you do notice them, beautifully! i can make a recommendation for #30! i have a list like that, too! 30 before 30... i think i crossed off like 2 so far and i don't have that much time left! ;p good luck with your list! a very fine list, indeed -- looking forward to watching it all unfold. My brother lives in Victoria, I'm in Toronto. Victoria is so beautiful you might not want to leave. Enjoy yourself. Just wanted to let you know that I Love your Blog and read it faithfully....because I enjoy it so much I have nominated you for an award! Check it out! I love your lists! I make them every year-- every birthday, every new year, each summer-- and I love the way they guide my time and my energy and the sense of accomplishment I get when I check one off. Have you heard of the 101 things to do in 1001 days website? That has a whole collection of people's lists posted and it's really neat. Great list! Looking forward to hearing about you doing all of them! I was impatiently waiting for your list, such an inspiration! Great things all around, do the jar of magical thinking, I kept a journal for a while with my son's words, and stories... it is a treasure we all love. Photograph Von's studio... So that means a trip back to NYC yes?! Sounds like you have a fantastic year ahead! well this is just one of the best lists ever. good luck! Hi Andrea :o) I would so accompany you to the flavour waffle cart. Let me know if you need a partner! oh! I admit to be another who's taken this page from your book; it's so perfect, so inspiring. yours! oh, delight. rain boots are really essential (I have two pairs). I lived RIGHT ACROSS from the Velveteria and never went! I've also never been to the bins but I hear it's really something. wahkeenah falls is a wonderful hike; I swear by the eastbank esplanade (for runs, not bike rides -- I'm the only Portlander without a bike); I have traversed the st. johns bridge by foot. I had no idea there was a waffle cart ANYWHERE and now I want to go. as in, right now. good luck with this year :) we can't wait to see you knock some things off this list. I always love that kind of lists... but never wrote one for myself. I'm still thinking about it. Maybe i'm afraid of not acheiving it? Just wanted to say hello...wandered over from Red Velvet. I'm now inspired to visit the Velveteeria and also to start my own magical thinking jar. Great photo of the stars! Among other things, I'll be interested in how you do with the Yashica. Your lists are always so fun and inspiring--thanks for sharing! You should visit Canada ... but more specifically, you should visit Charlottetown in the summer, Kingston in the fall, Winnipeg in the winter (Le Festival du Voyageur, of course), and anywhere in British Columbia in the spring. It is a big country. I love seeing all the cool places you find in Portland that I've never heard of. Velveteria?!?! Good luck on your list, it is very inspiring! My first camera was a yashica and I loved it! Enjoy! 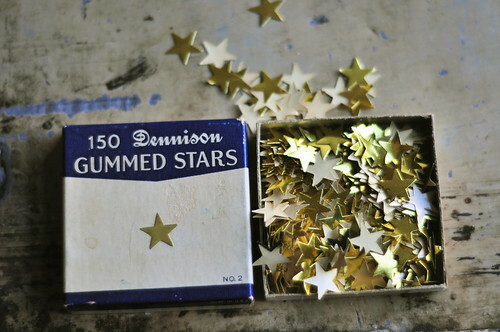 I remember those stars from 3rd grade! I like your list, good luck with it. I'll be 48 on March 11th, I think I need to make a list too. Thanks for the inspiration, again. Awesome list. I should get cracking on something similar. There are many on yours that I'm still trying to do and some that I will never be able to do. But it shows how fun and interesting life can be, eh? Fun list...just saw that you are my neighbor...hello! i love your blog. i have to tell you, me and my boyfriend drove past the st. johns bridge this weekend. my boyfriend turned to me and said...who's that blogger that said she wanted to go across the st. john's bridge? i was so impressed he remembered! :D it made me very happy! 7 so worth your time!!! 38 angry chicken has a SUPER EASY crust recipe that is most excellent! yummy and easy pie recipes too. If you really want to embroider and you would like it to be fun, then go to sublimestitching.com and get the one of the starter kits. Jenny Hart lets you pick out the patterns you want; all of them are super fun! ; and gives you everything you need to get started. The patterns are iron on, which makes life so much better!This way is much easier then trying to go to the store and do it. I would go to the craft store for more colors of floss and a floss case which you will 100% need, they are about $2.00 I think. Your first project should be a tea towel or flour bag depending on where you live, which you can buy at Walmart for $5.00 for a pack of 5. Long time reader first time commenter... haha. In regard to #3...GLACIER. Glacier National Park. thats all I have to say, and thanks for being the kulest in bloggy-land. Wow...I need a list. This one is simply fabulous. hope you don't mind. I linked this post on my brand new blog. You are the inspiration for it. Oh GOD I miss Portland, my heart simply aches for it. your lists are lovely, perhaps I should bond with the place I am now and make one for it. I LOVE your list and your blog! I was so inspired by your list that I made my own. I hope you don't mind. Please let me know if you do and I'll be happy to take it down. I just posted mine too! 41 before 42. I'm way late on this, but since I just turned 38, I will get on my list post haste! Such a great list of ideas - thanks for the inspiration! What a great idea! I'll do it too! woohoo! This is a very good source of information and it is amazing that your giving it away for free. Thanks !